All kids love to play dress up. Even though my son is older, he won’t let me throw away his box of costumes. From about 3 to 5 years old it was pretty much his favorite thing to do. The same held true for kids in the thirties. Kids were very imaginative and they loved to pretend to be all kinds of things. The great things about the boys costumes back then is that they were all made of solid parts. They were suede and metal and cotton. Some had real fur, others had imitation leather. But it WASN’T PLASTIC! Coat of scarlet cotton twill with brass buttons – epaulets – and four pockets. “Mountie” Insignia on collar and pocket. Navy blue cotton drill breeches. Brown cotton suede finish puttees. Large tan cotton suede cloth hat. Real leather Sam Browne belt and holster. Large toy pistol. Sizes 4, 6, 8, 10, 12, 14 yrs. 7-piece outfit. Sold for $3.49 in 1937. Coat and breeches of tan khaki cotton drill. Two flap pockets. Flyer’s insignia. Imitation leather Sam Browne belt and puttees. Includes helmet and goggles. Young pilot’s outfit! Trim fitting coat and breeches sturdy khaki drill. Natty Sam Browne belt and even a pair of goggles to shield your eyes from wind and glare. Sizes 4, 6, 8, 10, 12, 14 yrs. Sold for $1.98 in 1937. Genuine fur front chaps. Plaid cotton flannel shirt and large toy pistol and holster. It had a belt, lasso, black cotton suede cloth hat, decorated khaki cotton drill vest and a colorful bandana. Even your favorite cowboy movie star doesn’t wear a finer outfit than this! The chaps are REAL FUR. It’s their finest suit in my opinion. Sizes 4, 6, 8, 10, 12, 14 yrs. Sold for $2.95 in 1937. Every boy wanted the Two-Gun Pete. I mean, who wants one gun when you can have two? It came with brown imitation leather front chaps with two decorated holsters of cotton suede cloth. 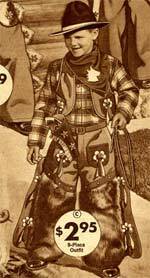 It also had a plaid cotton flannel shirt, imitation leather vest to match chaps, bandana, two big six-shooter pistols, a lasso and a black cotton suede cloth hat. Bang! Bang! Look out for Two-Gun Pete! He’s got TWO big pistols! Sizes 4, 6, 8, 10, 12, 14 yrs. Sold for $2.49 in 1937. Dapper Dan was the middle level costume. It’s what the middle class parents could afford — and it looked nice. It came with khaki cotton drill chaps with metal spangles and fur and feather trim. It had a bright plaid cotton flannel shirt, fur decorated cotton khaki vest, cotton khaki hat, a lasso, a bandana, a large toy pistol, a holster AND A BELT! That’s a lot! Dapper Dan wears a fur trimmed suit that’s the envy of the whole corral. Vest has fur pockets and chaps have fur side trimming. Sizes 4, 6, 8, 10, 12, 14 yrs. Sold for $1.89 in 1937. Broncho Bill was the budget costume. Except back then, even the cheaper stuff was made well. It wasn’t this crappy plastic they make costumes out of now. Rant over. Broncho Bill came with khaki cotton drill chaps with fancy side trim, elastic waist, plaid cotton flannel shirt and a bright bandana. It also came with a cotton khaki cowboy hat, a belt, a lasso, a toy pistol and a holster. Broncho Bill’s outfit costs less, but it doesn’t miss any of the trappings a cowboy should have. Chaps have fancy side decorations. Sizes 4, 6, 8, 10, 12, 14 yrs. Sold for $1.09 in 1937.